Skillfully crafted, this piece is a wonderful addition to already popular Gourmet Skillet family. The sloped sides on the 14.9 in. (37.8 cm) skillet are ideal for searing meats to creating vegetable stir-fry, making pancakes for the family, frying fish, and other healthy recipes of volume. Good Food. Good Friends. Great Idea. A Saladmaster cooking show is a fascinating way to share an educational cooking experience in your home with family and friends sampling delicious foods. It’s also great inspiration for learning new ways to cook healthy, delicious food in less time. 2017 Regal Ware, Inc. All Rights Reserved. 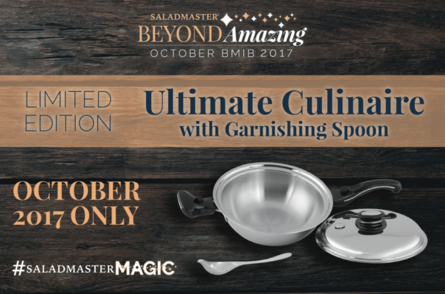 Saladmaster could not be more proud to have Cathy as our exclusive recipe contributor and culinary health expert. We trust you will love her recipes as much as we do! Because of her culinary skills and health expertise, Cathy is trained to work with cancer patients and with anyone who wants a weight loss diet, anti-inflammatory diet, gluten-free diet, vegan diet, vegetarian diet, raw food diet, alkaline diet, MS diet, autism spectrum diet and more. Learn more about Cathy by visiting http://www.anaturalchef.com .